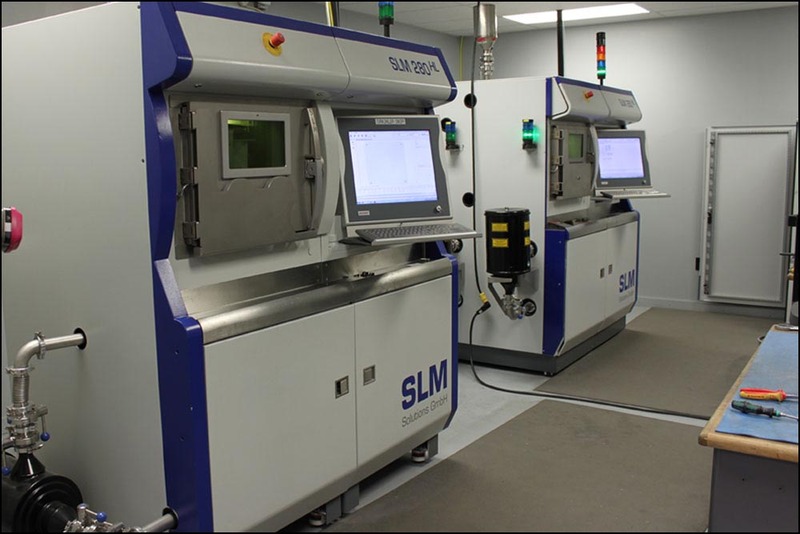 Imperial Machine & Tool Co. took delivery of their first metal additive manufacturing (AM) machine in 2013 — a Selective Laser Melting system from SLM Solutions. The decision to invest was made after seeing one of these “metal 3D printers” in action, growing a component layer-by-layer from titanium. That demonstration made it clear to Imperial that this was powerful technology, and would play an integral role in the future of advanced manufacturing. An SLM 280 HL and an SLM 280 HL “Twin-Laser” in Imperial’s additive manufacturing laboratory. 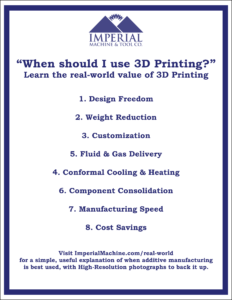 The “dive-in” approach employed by Imperial has provided them with unique and useful insight — especially for those wondering how additive manufacturing will affect their own business. LIA invited Imperial to share some of their insight during a 30 minute presentation at the Industrial Laser Conference held at IMTS 2016. This article focuses on some of the key takeaways from that presentation. Why Invest in Metal Additive Manufacturing? Christian began the presentation by sharing some background on Imperial, and the primary reasons they decided to get into metal additive manufacturing. “Imperial is a 73 year-old advanced manufacturing company. Since the 1940s, we’ve been known for tackling the most challenging machining and fabricating efforts in the industry. Our earliest work was for the military and we still do a large amount of work for the DoD, but over the years we’ve expanded to serve many other high-end sectors including the semiconductor, energy and optical equipment industries. The second reason was more personal. Christian went on to explain how the impact of additive will be felt across all industries in a variety of ways. For example, current Imperial customers working in laser and energy beam related industries are particularly interested in metal AM for the conformal cooling possibilities. Christian explained that customers are looking for high-quality end-use components. Additive manufacturing can help realize innovative new designs, but they are not pulled straight from the printer. Precision machining a metal 3D printed component, part of the “Hybrid Manufacturing” approach. 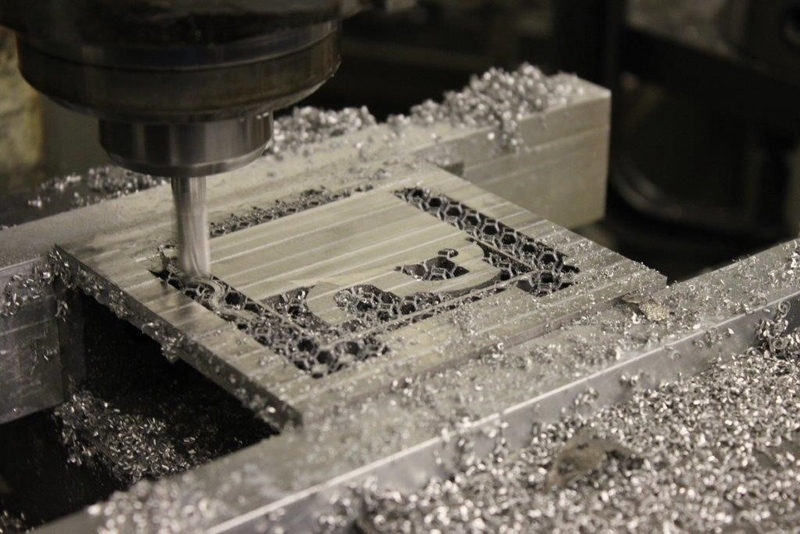 To successfully yield end-use components Imperial had to develop a “hybrid manufacturing” approach — using their additive capabilities in conjunction with their traditional machining capabilities. For example, they might use their metal printer to manufacture a topology optimized hydraulic manifold with complex internal channels, but they still rely on high-precision CNC machining centers to mill special SAE threads and flatten critical mating surfaces. That’s in addition to the thermal conditioning operations Imperial performs to yield the best material properties. All of these steps must be planned and accounted for before manufacturing begins! This is a far cry from pulling an end-use component straight from the printer. Christian went on to explain the education process that must occur when interacting with new customers; getting the most out of additive manufacturing requires an understanding of what it’s best used for. The value of AM is not in making the same part designed for CNC machining on a metal printer, it’s in realizing designs never before possible. Christian spoke of how Imperial works closely with their customers to ensure they understand the reality of when additive manufacturing makes sense, and when it does not. Metal additive manufacturing is already making a big impact for Imperial Machine & Tool Co. and their customers. How will metal AM affect you, and what you do? Wesley Hart is the Marketing Director of Imperial Machine & Tool Co.